We are saving up for our GloPro. We missed it when HSN offered this hand-held micro-needle device, which is supposed to help eliminate wrinkles and give you younger-looking skin. The New York Times on Thursday did a story on GloPro, and the lede was about vendor Jamie O’Banion hawking the device on HSN for $199, with much success. Last March the item sold out on HSN in 12 minutes, according to The Times, with 22,000 “flying out the door,” as the hosts would say. That amounted to 400,000 greenbacks. Last year sales of GloPro — which is available at not only HSN but snooty Neiman Marcus and Bergdorf Goodman — hit $30 million, The Times reported. HSN wouldn’t release its figured, but did say that GloPro is a top-selling item. O’Banion is the founder of Dallas-based Beauty Bioscience, which makes the device. There’s scientific research, cited in the paper, that GloPro works, and it was called “Beauty’s New Cult Device” by Women’s Wear Daily. Singer Sheryl Crow, whose “My Favorite Mistake” is one of our favorite songs, is the latest celeb to be doing a fashion line for HSN. HSN CEO Mindy Grossman revealed that little tidbit during a fourth-quarter analyst call on Wednesday. “We will celebrate Music City in Nashville, exposing customers to performers who have developed exclusive collection for HSN,” Grossman said, according to a transcript provided by Seeking Alpha. Crow’s line will debut April 13. Entertainment and lifestyle retailer HSN has partnered with singer, songwriter, and now fashion designer, Sheryl Crow for the upcoming exclusive debut of her first ever lyric inspired fashion line, Sheryl Crow, on April 13th. The eponymous collection is vintage-inspired and features easy to wear styles for the everyday girl with a rock n’ roll twist. Each piece comes with an empowering and affirmative handwritten personal message or inspiring song lyric from Sheryl. With prices ranging from $39.90 to $299.90, Sheryl Crow features effortless, ageless apparel and accessories that include novelty tanks and tees, embellished skinny jeans, denim jackets, cow-girl boots and booties, lightweight scarves, and a hobo bag. HSN reported on Wednesday that its net sales dipped 1 percent, to $769.3 million, in the fourth quarter versus the prior year. Operating income also decreased, by 2 percent, to $64.6 million. Digital sales rose 9 percent, with penetration increasing 440 basis points to 48 percent. HSN’s sales increased in wellness, culinary and electronics, offset by decreases in jewelry, apparel and accessories and in shipping revenue. The decrease in shipping revenue was primarily due to changes in the standard shipping rates, which became effective in last August, as well as increased promotions. HSN is part of HSN Inc., which also includes the Cornerstone unit. HSNi’s net sales decreased 2 percent in the fourth quarter, to $1.1 billion, with Cornerstone’s net sales dropping 5 percent, to $304 million. “Clearly, 2016 was a year of disruption in retail characterized by a distracting environment, cautious consumer spending and a heightened promotional climate,” HSN Inc. CEO Mindy Grossman said in a canned statement. “In addition to the disruptive retail climate, our overall fourth-quarter results were affected by certain under-performing product categories — particularly jewelry at HSN and areas within home in the Cornerstone portfolio, the standardization of our shipping and handling practices at HSN and implementation of our supply chain optimization initiative. Also, our year-ago comparisons were distorted by the divestiture of two businesses,” Grossman added. The home shopping network’s average price point decreased 2 percent, largely due to an increase in promotional activity and changes in product mix. Units shipped increased 2 percent. Gross profit decreased 9 percent to $229.7 million. Gross profit rate decreased 250 basis points to 29.9 percent primarily due to higher shipping and handling costs and lower shipping revenues. The increase in shipping and handling costs was largely due to the issues with the implementation of HSN’s supply-chain optimization, changes in product mix and increased shipping cost rates. The implementation issues reduced gross profit by $13 million, or 160 basis points as a percentage of net sales. Operating expenses increased 1 percent, to $165.1 million. Adjusted EBITDA decreased 25 percent, to $75.8 million. Excluding the impact of the supply-chain optimization implementation, operating income was $80.6 million and adjusted EBITDA was $91.8 million, representing a 9 percent decrease. HSN Inc. also appointed Rod Little as chief financial officer, reporting to Grossman. He comes to HSNi with significant public company expertise in the consumer-products industry, having served as CFO for Elizabeth Arden Inc. as well as a variety of leadership positions with Procter & Gamble. “We expect our hard work and learnings from 2016 to position 2017 as a year of growth regeneration, with a laser-focus on our proprietary product pipeline; driving customer acquisition, retention and spend; optimizing digital platforms; leveraging our distributed commerce capabilities; advancing our supply chain initiatives and cultivating talent across the organization,” Grossman said. Wolfgang Puck has had at least one temper tantrum on HSN that we blogged about. Now the celebrity chef used some really salty language on the home shopping network, according to TMZ. We don’t know how they got the video, or who other than nuts like us were watching HSN late-night, but Puck used a naughty word starting with “F” that rhymes with his last name. He said it very nonchalantly, as if forgetting he was on-the-air live. We thought there was a time-delay on home shopping channels to avoid just this kind of thing, but the censor did not catch the profanity. Host Susan Runyan, ever the pro, just glossed over it and pretended like Wolgang hadn’t said anything out of the ordinary. We already reported that actor John O’Hurley, who played Elaine’s boss on “Seinfeld,” was coming to Evine with pet products. The No. 3 home shopping network on Monday put out the press release on his premiere. MINNEAPOLIS, Feb. 13, 2017 (GLOBE NEWSWIRE) — Evine Live Inc. (“Evine”) (NASDAQ:EVLV), a multiplatform video commerce company (evine.com), today announced that it will premiere “Pet Shoppe with John O’Hurley” on February 17, featuring the former “Seinfeld” star and host of “The National Dog Show.” Blending entertainment, education and shopping, the show aims to provide animal lovers with an assortment of unique products and helpful pet care tips. “Everyone immediately recognizes John O’Hurley as J. Peterman on ‘Seinfeld,’ but many don’t know of his love for dogs,” said Bob Rosenblatt, Chief Executive Officer of Evine. 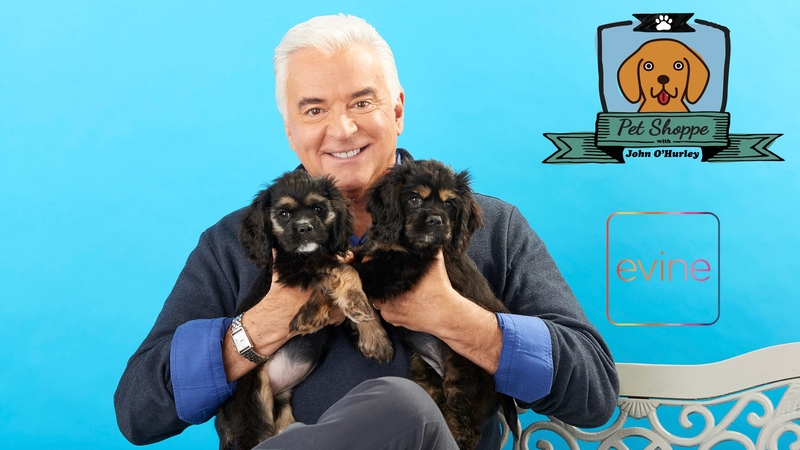 Premiering Friday, February 17 at midnight, 6am, 11am and 6pm ET, “Pet Shoppe with John O’Hurley” will offer a variety of unique and innovative items for both dogs and cats. During the show, O’Hurley will share his expertise with viewers and provide education on different dog breeds, with the intent to help pet owners better understand their four-legged family members. He has also written three books, including New York Times’ bestsellers: ‘It’s Okay to Miss The Bed On the First Jump,’ ‘Before The Dog Can Eat Your Homework, First You Have To Do It: Life Lessons From A Wise Old Dog To A Young Boy,’ and ‘The Perfect Dog,’ published by Penguin Books. John is an animal lover who’s thrilled to share his lifetime experiences to help advise viewers who love their pets as much as he loves his own. We don’t know if these have been successes or not. We do know that some of the movies that HSN has tied product to have flopped. Anyway, here’s Thursday’s press release. The story and characters audiences know and love come to spectacular life in the live-action adaptation “Beauty and the Beast,” a stunning, cinematic event celebrating one of the most beloved tales ever told. As far as we know, Evine pioneered rerunning its prime-time programming in the overnight hours, the wee hours of the morning. That was a switch, since it’s a home shopping tradition to broadcast live 24/7. Maybe we’ve just missed it before, but early Thursday morning for the first time — at least that we’ve ever seen — QVC reran host Jane Treacy and gem expert Peyton Kelley’s introduction to the TSV. It is Gem Day at QVC. Anticipating a snow day, we were up watching QVC at 3 a.m. or so when we saw a presentation on a rainbow-colored sapphire bracelet that sounded familiar. It was familiar because we had seen it shortly after midnight. On-screen QVC said that the programming had been previously recorded. We didn’t stay up long enough to see how many hours of the earlier programming, the “Gem Day Grand Opening,” was rebroadcast. We love it when home shopping networks are innovative and move out of their studios to broadcast live from location. Evine just did several days of programming from the Tucson gem show, and now it is moving from the arid desert to the sea. The network Wednesday said it will air a live watch event aboard the Carnival Victory Cruise ship starting today, Thursday, through Monday. Now class, guess which timepiece line is being featured? Oy, yes the “Invicta Ocean Voyage Live” event “will take fans inside and behind the scenes of an Invicta-themed cruise experience,” according to the press release. “Evine regularly transports customers to exotic shopping destinations, but we’ve never done anything quite like this,” Evine CEO Bob Rosenblatt said in a canned statement. Over the past 15 years (it actually seems like an eternity), Invicta and Evine have done more than 30 destination-based events, from various sites in the United States, Mexico and the Bahamas. Evine also tooted its own horn, pointing out that it has broadcast live from Las Vegas, New York City, Waterford Ireland. It also airs a weekly show from Paula Deen’s Savannah, Ga. The “Invicta Ocean Voyage Live” begins Feb. 9 with a broadcast from the Invicta Marine Pavilion before the ship sets sail the following day. During the Invicta event, Evine will be hawking more than 100 new designs. “One of the things that sets Invicta apart from almost any other brand is our community of passionate watch enthusiasts,” Eyal Lalo, CEO of Invicta Watch Group, said in a statement. First, HSN pulled Bajalia jewelry off the air and its website. Now, it has joined a number of businesses, such as Nordstrom, that are dropping Trump-related merchandise. There were numerous media reports, a bit muddled, on Tuesday that said HSN had stopped offer Ivanka Trump items. We never remember the network selling them. Other accounts claimed that it was Trump Home products, some lamps, that were dropped by HSN. The network copped to dropping something. “At HSN we are non-partisan and our product decisions are based solely on a continual evaluation related to our business,” HSN flak Jill Kermes told told BuzzFeed News. You are currently browsing the Homeshoppingista's Blog By Linda Moss blog archives for February, 2017.